I don’t see that you have created a website. I would spend my energies on that, including a blog, before radio. You will be able to direct people from social media and from your broadcast emails (as Janna Glidden Sewell mentions) to your info on your website, and personalize your store in your website’s blog, linking it to your social media as well. Click to see the Sabatino family full size! A website is also the easiest way to build your email list. And if you have uses a website, the press-release tactic and the group-ad newspaper page that Jackie Hersey talks about can always have a “learn more at MyShop.com” line in it. Since your shop will be kidswear, Tiffany, I’d blow the money to rent or buy a birth announcement stork and fill my display window with it for at least a full month before and after you actually open to the public. 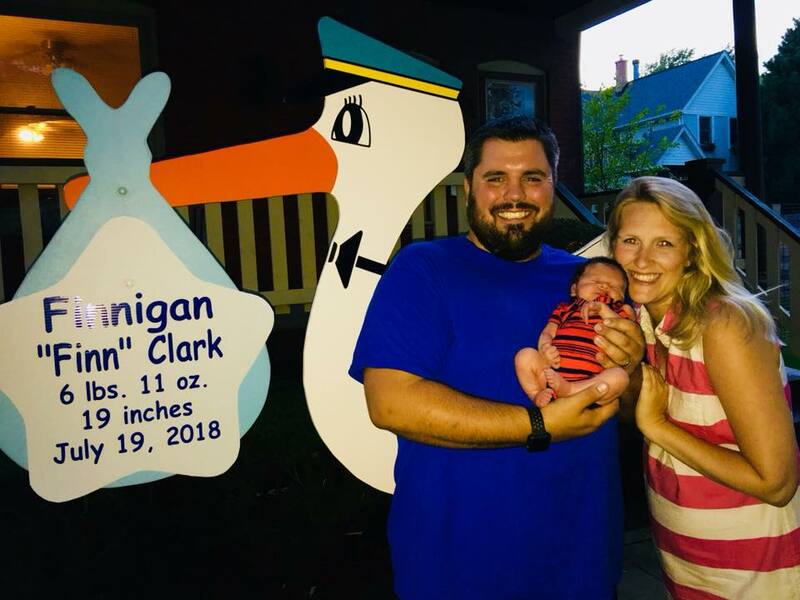 This photo is from a resaler’s real baby homecoming (Thanks Amanda Sabatino of Trends Oak Park for sharing a glimpse into your new life as a mom!) In fact, you could even bill your Grand Opening celebration when you retire him as a Farewell to the Stork and Hello HomeTown Kids! party. Finally, once you are open, offering a free brochure by email that would appeal to your clientele (things to do free with your kids, 10 Basics for their Back to School Wardrobe, a list of other resale outlets in your area). I would create it as a PDF that you can attach to a welcome-to-our-email club freebie. Super-cheap to FREE to produce, gets their emails into your list, and positions you as the EXPERT in your market area. Hey there! I found that building my email list has been one of the most critical pieces of promoting my business, outside of our fb, insta and website. I have also had tremendous feedback from our Google business listing, just by making sure I regularly upload new photos and post sale events, which is all free on your Google business maintenance page. Shoppers mention our Google posts and photos, often! Once you set up your free Google business page/listing, there is a maintenance page for you to adjust store hours, add photos, store description and post events. Also, Yelp has been huge for me. New people to the area or new to resale definitely rely on reviews they find online, which my shoppers also mention “we saw you on Yelp!”. I wish you much success! Kate, this is fantastic!! I love the stork idea and it got serious wheels turning. I’ll send you pics of what I come up with. Thank you for always being such a great resource! I was really excited, too, Tiffany, when Amanda’s birth announcement photo reminded me of this possibility! I can’t wait to see what YOU come up with for your new shop. We think handwritten notes on the bottom of checks to our consignors keeps us top of mind with them. We have used great photographs of fashion models in our windows to catch drive by traffic. In one case this is an attractive fashion blogger who uses a professional photographer and sells us the shots for our website, emails and the banners.